COMING MAY 1st: “The 2nd Annual Hudson Children’s Book Festival” — Highly Recommended! I don’t know how to say this except for . . .
You should go. YOU should go. You SHOULD go. Really, you should go. It’s a great event. And an absolute privilege that it’s up in our neck of the woods (in my case, maybe the collarbone). If you value reading, if you want to send that message loud and clear to your children, if you want to make that reading/writing connection, if you want to have fun . . . come, come, come. Where and when else in your entire life do you get this opportunity? It’s FREE. There will be more than 100 authors and illustrators — and not just the hacks! We’re talking hugely popular folks, rising up-and-comers, cagey veterans, with a range of titles of interest to preschoolers up to young adults. You want names? Here’s some names: Aimee Ferris, Alan Katz, Alexandra Siy, Anita Sanchez, Ann Haywood Leal, Ann Jonas, Anne Broyles, Barbara Lehman, Bruce Hiscock, Charise Harper, Da Chen, Daniel Mahoney, Danielle Joseph, Daphne Grab, Donald Crews, Emily Arnold McCully, Eric Luper, Eric Velasquez, Eve. B. Friedman, Gail Carson Levine, Jacqueline Rogers, Jan Cheripko, Janet Lawler, Jennifer Berne, Jo Knowles, John Farrell, Kate Feiffer, Katie Davis, Kyra Teis, Karen Beil, Marc Tyler Nobelman, Mark Teague, Maryrose Wood, Megan Frazer, Melanie Hall, Michelle Knudson, MJ Caraway, Monica Wellington, NA Nelson, Nancy Castaldo, Nancy Furstinger, Neesha Meminger, Nick Bruel, Olugbemisola Rhuday-Perkovich, Pam Allyn, Peter Marino, Doreen Rappaport, Richard Michelson, Rose Kent, Seymour Simon, Siobhan Vivian, Suzanne Bloom, Sylvie Kantoroviz, Thomas Locker, and many, many more. Seriously, it’s a staggering array of talent — with books for every kind of reader, of every age. Do you know what else is FREE? Every kid who comes will be handed a free book, many of them signed by the authors. There are more than 2,500 books, many different titles, waiting for young readers. 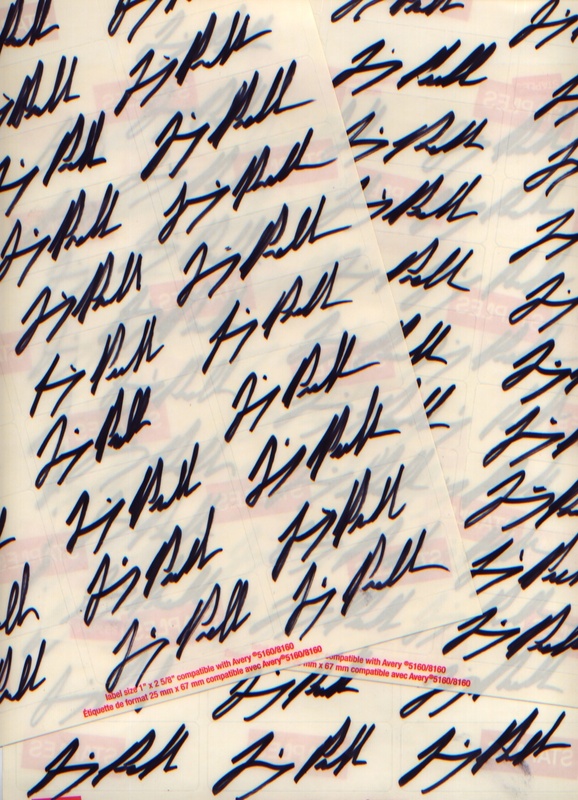 I spent a couple of hours signing labels the other day — WORST AUTOGRAPH EVER! 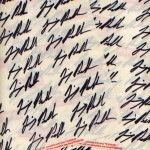 Horrid southpaw scrawl, sigh. On a personal note: We see a lot of mothers at these things. Where are the fathers? When we talk about the reading gap, and how boys are falling behind in literacy skills, how Johnny doesn’t like to read, I keep coming back to one basic thing: These boys need to see Dad reading. As fathers, it is the most powerful message about reading that we can send our children. We model the fine art of sitting in a chair and getting lost in a book — any book, of any kind. We show them that reading is a Guy Thing. So come on, dads, bring the kids to the Hudson Book Festival! Show ’em that you value reading. ADMISSION IS FREE. FOR FULL DETAILS, CLICK LIKE YOU MEAN IT. If you’d like to hear me, along with event coordinator Lisa Dolan, discuss the Festival on the WAMC Roundtable Show with Sarah Laduke, click here and hear us roar!